TP20 CMM Touch Trigger Probe - CMM Inc. The TP20 Touch Trigger Probe system offers a compact and unique design. Specifically, it allows a range of stylus configurations and extensions to access features on complex parts. It can also be adjusted to a 5-way or 6-way kinematic touch-trigger probe system. The TP20 is comprised of a two-piece design, which includes the probe body and detachable stylus module(s). These are connected using a highly repeatable magnetic kinematic coupling, which provides ability to change stylus configurations (either manually or automatically) without the need for requalification. The TP20 system is easily retrofitted and is compatible with existing touch trigger probe interfaces, extensions and adaptors. A set of probe extensions are also available and the stylus mounting thread accepts styli from the Renishaw M2 range. 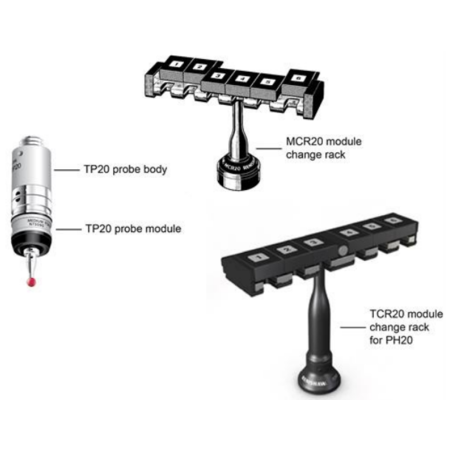 A range of seven (application specific) probe modules are available for the TP20. Each of them are identified by coloured caps. The MCR20 probe module changing rack is designed to securely hold stored modules for rapid automatic changing. It is also meant to protect them from airborne contaminants within the working environment. The MSR1 module storage rack safely holds up to six modules. 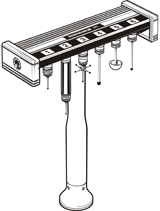 It simplifies manual module changing and thus aids measurement productivity. The MSR1 can be mounted on the CMM table or on a vertical surface.